The historical center of Paris is one of my favorite parts of the city and offers several options for keeping smaller kids amused - even in winter. H returned to the UK on January 2, and T is pretty much devastated. I'm of the "it's ok to feel sad - let's work through our feelings rather than suppress them" philosophy, so we talk about him a lot, look at photos of the three of us doing family things, and have plenty of phone calls...even if it makes her cry. And though she understands he'll be back in a few weekends, she misses him a lot. To show her that life goes on and that we can still have an eminently good time (and to spend her last day of Christmas vacation doing something other than lounging on the sofa), I took her into town. 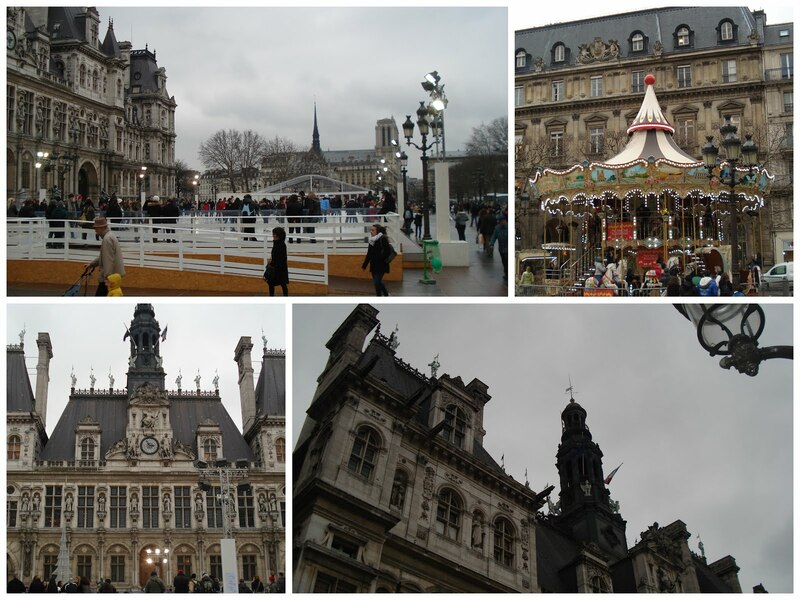 It was drizzling, so I initially wanted to go to Palais de la decouverte, a science museum in the 8th arrondissement. But since it stopped by the time we reached the train station, I decided to take her to the Ile de la Cite area instead. We got out at Hotel de Ville (4th). Though I wasn't planning on lingering, T was captivated by the Place de l'Hotel-de-Ville, especially the ice rink (which will be there until March 17). 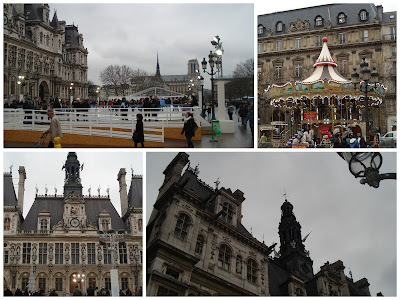 And she was delighted to continue her test rides of Paris carousels with the one on the square - still free like on Place-Saint-Sulpice last week (here is a list of participating carousels, though apparently the scheme officially ended on January 1). It was all quite busy so we had to wait a good 20 minutes to get on the carousel. 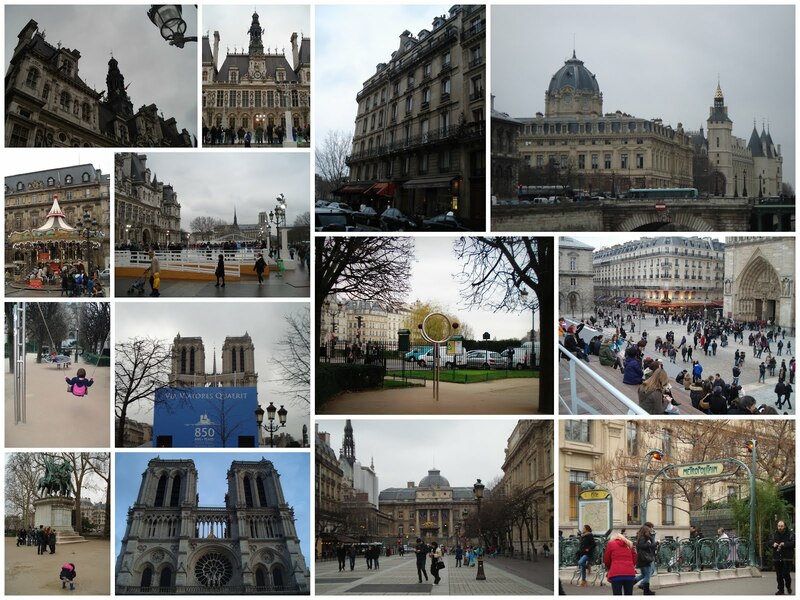 After an hour or so on the square, we headed over to Ile de la Cite. On the way there, T was sidelined by pretty much every tourist shop. With the battle cry "Oh, it's so cute!" she ran from one store to the next. 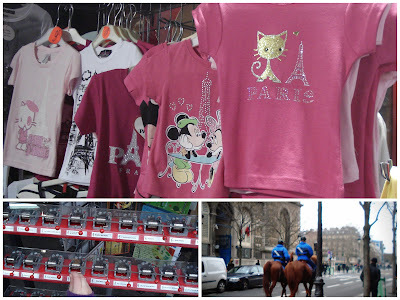 She was disappointed that I didn't want to buy her mass-manufactured snowglobes or Eiffel Towers, but was happy enough that I took a photo of her "favorite pretty" tees. And another of two "police horse butts" which she insists must be included here. And those little musical thingies. 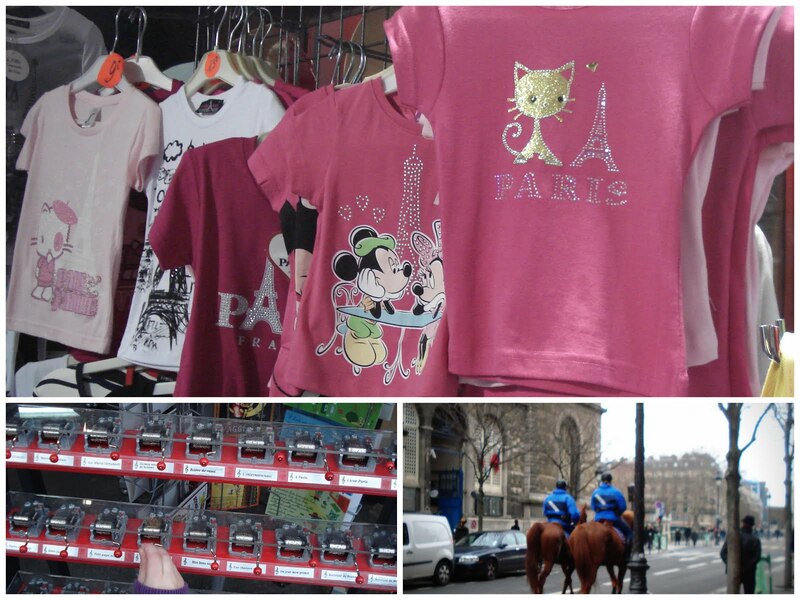 My first stop on Ile de la Cite was actually to go to the adjacent Ile Saint-Louis - home of Berthillon ice cream. Ever since I visited Paris with university friends in spring 2007, I've made a ritual of getting myself some scoops at Pain d'Epices whenever I'm in central Paris - they have an amazing flavor selection. But their window was closed, and I didn't want to spend €8.00 to eat two small scoops inside the cafe. So back to Ile de la Cite we went. - Manage the monkey's (and my) expectations for the trip. Don't expect too much walking; be realistic about the minimum / maximum time to spend at a place; take travel times into consideration. - Be comfortable. Dress the little one (and myself) in practical clothes that allow us to be active. Though my ratty Barbour jacket won't land me on The Sartorialist, I was glad that T's sandy footprints didn't end up on my "good" winter coat. 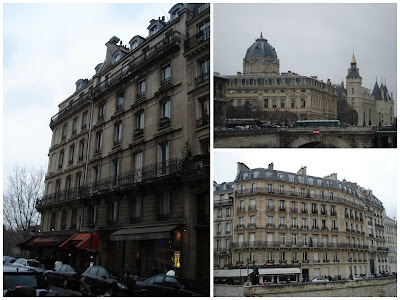 Building on these pillars, I encouraged T to spend herself on Ile de la Cite's playgrounds. Neither of these areas is especially big - one, right behind Notre Dame, has a swing, turntable thing, and what I'll describe as a futuristic monkey bars for want of a better term. The other, on Notre Dame's right (seen from the front - so on the south side), has two spring riders and two seesaws (one spring rider and seesaw pictured). Both playgrounds are quite clean and the toys are in good shape - and probably due to the miserablish weather, they were quite empty (this is not the case in the summer). 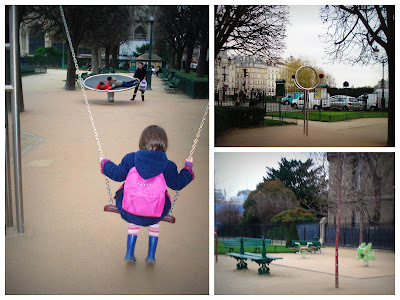 Besides the playgrounds, T also enjoyed jumping in some muddy puddles such as the one in front of Charlemagne et ses leudes. Her favorite thing on the isle was the viewing platform (think giant bleachers) put up to commemorate Notre Dame's 850th anniversary. It's quite safe, so T's athletics and stair runs only freaked me out a little bit. 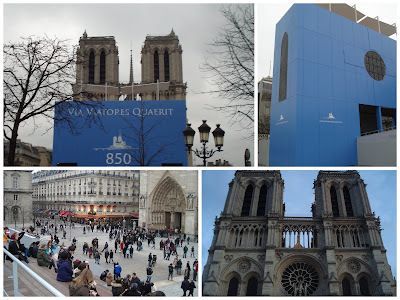 We didn't go into Notre Dame itself; the line was long and T was not in a spiritual mood. I highly recommend it though - it's free, but I usually donate in exchange for votive candles. I really want to visit the Crypts some time (even though I'm a bit of a thanatophobe), but it clearly wasn't an option with T at my side. And since she was showing her first signs of exhaustion, we didn't explore the island in more depth and headed home. This led me to what is currently my "weirdest thing you've seen on public transport" incident. As I got out to switch metros at Chatelet (carrying a yawning toddler), I saw a homeless-looking man stretched across the row of seats right on the platform. He had a blanket over his head and torso, his pants (US meaning, so trousers) down to his knees, and was either having a seizure or - more likely - masturbating. As a seasoned nothing-can-phase-me cosmetropolitan I joined everyone else in drawing as wide a berth as possible around him and averting my eyes. As a curious toddler, T's instincts go in the direct opposite direction. She peppered me with questions about the situation (though they were all about why he was lying down and had a blanket on his head). So I could easily reply "He's probably quite ill." I would have alerted a station guard had I seen one (my logic being if someone's inhibitions are so low, there's no telling what they'll do next), but despite the proximity of Préfecture de police de Paris there was no one in uniform in sight. So this beats the giant leashed lizard I saw on the London tube a few years back - but I definitely preferred the reptile. To end on a more pleasant note, here are photographic and cartographic representations of our afternoon. The map image is from Google Maps.